Going on Vacation? Prepare Your Garden First! | Gardens Alive! Like many Phil-Elf-Yans, I love going 'down ashore' to eat wadder ice and walk the boards—but my garden does NOT enjoy my being away at the height of summer. 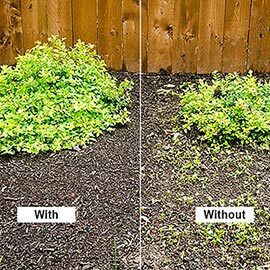 Weeds can get out of control, and plants often get toasted if we get hot weather without rain. And plants in containers are certain to suffer if you don't plan ahead and a heat wave hits. The Master Plan—Mulch or Be Miserable! Soak the ground for several hours overnight if it's been dry lately, and then mulch the garden well: An inch of shredded leaves, straw or dried clippings from an herbicide-free lawn covering every piece of bare ground will keep your plants alive if the weather is dry AND prevent your returning to a weed farm if it rains the whole time. Do not use wood chips or shredded bark for mulch; I know they're widely available and cheap, but they rob plant-feeding nitrogen from the soil and often prevent rainwater from reaching your plants. Apparently, 'root mulches' are just as bad as regular wood, but cocoa shell mulch is great if you can find it—as is 'salt hay'. And try and have a neighbor ready to water, too. This is a great opportunity to work out a deal with a fellow gardener to keep an eye on each other's plots during your vacations. Don't Let Your Garden Go Thirsty! Pay close attention to the extended forecast. If it looks like the garden will get lots of rain while you're away, don't worry (at least about the garden: "Oh, just go in the ocean anyway! Wet is wet!"). 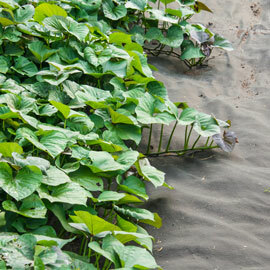 But if the call is for dry times, and especially if you can't get anybody to water while you're away, be sure to freshen up those mulches and soak the garden overnight right before you go away. Turn on the sprinkler when you go to bed and don't turn it off till you're ready to leave or 10 am; whichever comes first. around top revent slugs from eating everything while you're gone. No matter the forecast, pick as many edibles as you can right before you go away. Pack the car the night before, so you'll have time to harvest in the morning. Otherwise, you'll lose lots of tasty treats AND attract all kinds of pests to the garden. Pick all your zukes and cukes that have reached 'baby size'; they're really tasty when small—and you KNOW those zukes would turn into baseball bats by the time you get back! Take 'em with you and enjoy a little bit of home-grown goodness while you're away. WARNING: Pay Special Attention to Plants in Pots! Containers dry out much faster than the ground. If the forecast is dry, try even harder to arrange for someone to come and water a coupla times while you're gone. Otherwise, move the containers to a shady spot, group them close together to conserve moisture, mulch the tops at least two inches deep, and give each container a SLOW, thorough soaking right before you leave. Unfortunately, this may not be enough to save plants in unglazed terracotta pots; the sides of these containers wick their soil's moisture right into the air. Same with hanging baskets whose liners are made of peat or coconut ('coir') fibers. If it doesn't rain every other day while you're away, the plants inside those 'pots' could well be lost! Best bet: Have a friend baby-sit such plants at their place while you're gone. The Most Popular Plants Are Often the Thirstiest! Before you leave, make sure that the REALLY thirsty plants in your landscape, like azaleas, dog woods and rhododendrons have a nice fresh one to two-inch thick layer of mulch—shredded leaves, straw, or pine needles—to keep moisture in the soil; DON'T use wood chips or shredded bark. And REALLY soak their roots before you go; turn the hose on just dripping at the base of each plant for several hours each—preferably the night before you leave. And be SURE and have a neighbor ready to water if it's going to be a REAL scorcher and/or you're going to be gone longer than a week—especially if those plants aren't getting the afternoon shade they prefer. & DON'T Cut Your Lawn! Don't cut your lawn right before leaving; especially if you don't listen to my 'cut high' advice and scalp the poor thing. 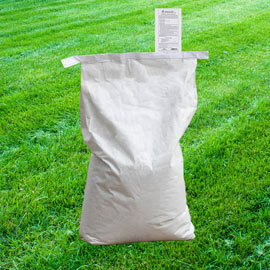 A lawn that's cut at the correct height—two and a half to three and a half inches—can easily go a week without rain. But a lawn that's cut excruciatingly short could well perish completely over the same week. And if the immediate forecast is dry and/or it hasn't rained for three days, give that lawn a good soaking before you leave. Turn the sprinkler on when you go to bed and don't turn it off for a good four or five hours—or even better, let it go all the way to the next morning. And if your sprinkler can't reach all your turf at once, break the chore up over several nights. And don't bring me back no salt-water taffy!